AK Travels is a renowned bus service in Bangladesh. You can travel Dhaka to Khulna by AK travels without any hesitation. The company gives you the best experience in bus journey. The mission of the transportation company is to make the customers happy by the superior services. The company provides its service in Dhaka, Khulna, Satkhira and Chittagong. You can buy or book your ticket from online or by a phone call. Kashem group from Satkhira owns AK travels, the most promising transportation service for southern Bangladesh. AK travels has the service for bus both AC and Non AC. the service is the most affordable for the passenger. You can travel Dhaka to Khulna by AK travels along with Satkhira, Benapole, Jessore or Narail. The main office of AK travels is in Kashem Group, Kashem Plaza, Abul Kashem Road, Satkhira.you can reach them by telephone: Tel: 02-4716353 and mobile: 01716-267120. AK Travels counters contact Number in Magura. You can buy your necessary ticket from any counters of AK travels. You can also book your seat over a phone call. The manager of the counter will provide your booked seat after your payment. You can also buy a ticket from the online. Buying a ticket from online is very easy. It saves your valuable time and money. 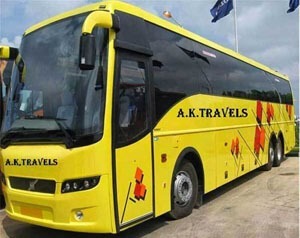 You can buy AK Travels online bus ticket from shohoz.com. The international service is not available yet. If it is available, a notice will go to the press and social media. AK Travels is a well-known and popular transport company in Bangladesh. It ensures the luxurious and enjoyable journey for the passengers. The company is very careful with the complaint of the passengers. If you have any complaint about their service any suggestion to upgrade the service, feel free to contact with AK Travels.